Addition reaction silicone (platinum catalyzed) impression material in tubes. Exaflex produces crisp, extraordinarily smooth and highly precise impressions for models, crowns, bridges, and dentures. Injection material has a working time of 2'' 15"; all other viscosities have a working time of 1'' 45". All viscosities have a setting time of 4'' 00". Contains: 1 tube base (74ml), 1 tube catalyst (74ml), 1 mixing pad. Contains: 20 tubes base (74ml ea); 20 tubes catalyst (74ml ea). 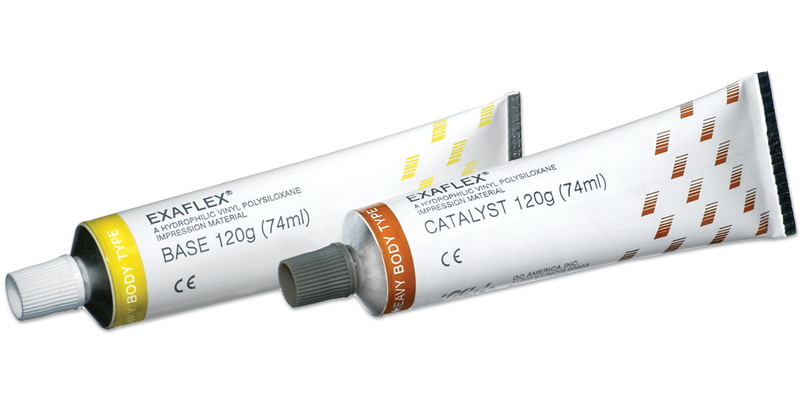 Contains: 1 tube base (74ml), 1 tube catalyst (74ml), 1 mixing pad, 7ml adhesive.